Lotería • Día de Muertos from Filios on Vimeo. This is the last of a series ('Lotería') of animations by animator Filios which focus on Mexican holidays. There were five animations in all, dealing with Mother's Day, Father's Day, Children's Day, Native Month and the above Day of the Dead. The animation style is unique and has a distinctive Mexican flair. They are all great fun and can be found on Filion's page. He describes himself as a "Motion Graphic designer in Mexico City, founder and art director at Voraz." 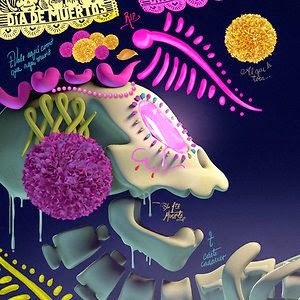 They are fun and quick - the "Day of the Dead" only runs 20 seconds - and well worth the time if you enjoy funky animation. El último de la serie "Lotería"
Wow! Thanks for sharing our work. This was produced at Voraz, as you mentioned, and co-directed by Eduardo Altamirano "CGmodeler" (who was a key element) and myself.